“Turning” is a very straightforward term in the nursing home care field: the term applies to the physical act of turning a patient’s body to prevent the formation of bed sores. When a patient remains stationary for too long, his or her blood begins pooling in the parts of the body closest to the ground. For example, if a patient is lying on his back, blood will start to pool in the bottoms of the feet, the back, and the backs of the arms and legs. If a patient requires the use of a wheelchair and remains in one position for most of the day, blood may start to pool in the buttocks, the backs of the legs, or bottoms of the feet. Turning helps encourage healthy blood flow for nursing home patients confined to bed rest or wheelchairs. It is essential for caregivers to understand the value of this simple but crucial act. A patient at risk of developing bed sores should receive personalized attention from a physician. The physician will likely recommend a turning schedule based on the patient’s overall medical condition. As a general rule, turning should occur every two hours at least. If a patient sits in a wheelchair for most the day, caregivers will need to lift him or her out of it for some time each day to restore healthy blood flow to the lower extremities. The ultimate goal of turning is to prevent the formation of bed sores. Some patients face an increased risk of bed sores due to various medical complications. Malnutrition. Elderly individuals with very low Body-Mass Index (BMI) ratings face a significantly higher risk of developing bed sores than well-nourished patients. This is because blood has an easier time pooling around the bony protrusions of the body like the elbows, knees, hips, and back. Poor nutrition also makes it harder for the body to fight infections and diseases and can make bed sores progress very rapidly. Motor disability. Most elderly nursing home residents will spend quite a lot of time sitting and lying in bed depending on various individual health factors, but patients who suffer from motor disabilities like paraplegia and quadriplegia are at significantly higher risk of developing bed sores. Patients with psychiatric conditions. Many elderly nursing home patients suffer from degenerative neurological conditions like Alzheimer’s disease and other forms of dementia. These individuals require compassionate, individualized treatment plans that should include regular turning or repositioning. Bed sores are extremely dangerous medical issues that require thorough treatment. If left unchecked, bed sores can cause sepsis, a potentially fatal condition that occurs when bacteria from an open wound enters the bloodstream. Bed sores can also lead to bone and joint infections, causing septic arthritis and irreparable soft tissue damage. Bed sores can also cause the formation of cellulitis in the skin surrounding the sore, a condition that may eventually lead to the develop of life-threatening medical complications. 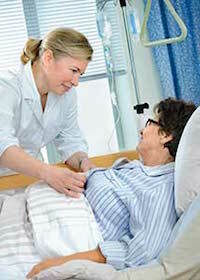 The two-hour rule is a general rule of thumb, but every elderly nursing home patient requires individualized care based on his or her unique medical needs. Some patients at significantly high risk of developing bed sores may require more frequent repositioning or specialized assistive devices. Malnourished patients need dietary support and supplements to encourage healthy weight gain and nutrient intake. Turning is a crucial element of bed sore prevention, but it is only one part of it. Nursing home caregivers need to know how to identify patients at extraordinary risk of developing bed sores and provide them with individualized care that addresses their unique medical issues. Bed sores are an incredibly common but generally preventable hazard facing countless nursing home residents. It is up to nursing home leadership and staff to make sound decisions when it comes to proper turning practices for patients in their care.